Two lines are perpendicular or orthogonal if they meet at right angles. For two perpendicular lines, all four angles formed by the two lines are equal to \( 90 ^ \circ\). Two non-vertical lines are perpendicular if and only if the product of their slopes is -1. In other words, the slopes of two perpendicular lines are negative reciprocals of each other. A vertical line has infinite slope and is perpendicular to only horizontal lines (which have slope 0). Given the equations of two lines, this gives a method to test whether the two lines are perpendicular. This also gives us a way to find equations of lines that are perpendicular to another line. In the 2-dimensional plane, given a fixed line and any point on the line, there is exactly one line passing through this point and perpendicular to the original line. In the following diagram, lines \(l\) and \(m\) are perpendicular lines. If \( \angle a=34^\circ\), what is the measure of \( \angle b\)? In the following diagram, lines \(PS\), \(QT\) and \(RU\) meet at point \(O\). 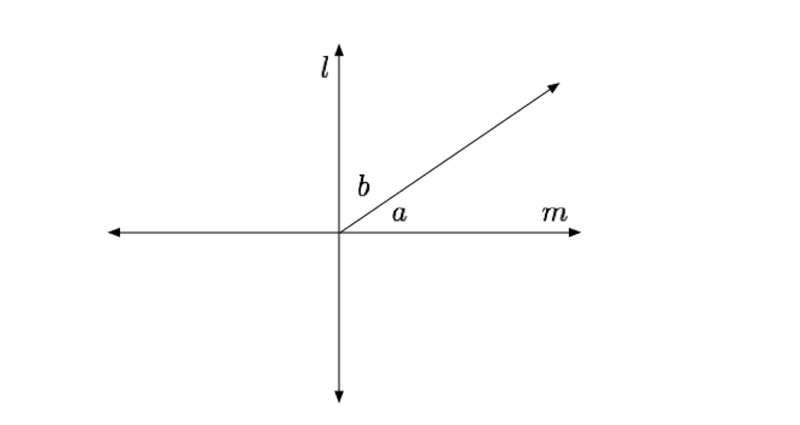 Given that PS and UR are perpendicular lines, what is of \( a + b \)? and passing through the point \( (-3, 9 ) \).